Even the most productive designers, programmers, and digital strategists encounter creative blocks at times. I asked some of the top independent tech professionals represented by 10x Management to share how they maintain peak productivity in the face of these obstacles. In the first part of this two-part article, Why Mastering Creative Consistency Is Vital For Tech Professionals, we looked at how the reliability of your creativity is the cornerstone of your value as a tech professional. Certainly, raw creative talent is important, but it’s the ability to consistently deliver that makes a potential employee a sound investment. While many people believe their creative spark to be governed by chance, top creative pros know how to ignite their creativity, preserve it, and rekindle it when it burns out. The essence of moving through creative blocks is to change something. Change what you’re doing. Change how you’re looking at it, or thinking about it, or doing it. Change where and when you’re doing it. But while some projects may temporarily be put on hold for a full mental restart, others simply can’t. Sometimes there are deadlines. That’s why you need different tactics for different situations: tactics for when you have the luxury to take a big step back, and tactics for when you don’t. The methods shared by our various 10x’ers, below, offer a range of changes for you to consider. 1. Exercise, play an instrument, or go for a walk: Do anything that primarily engages the body so that the mind can both rest and wander. 2. Seek inspiration: As a designer and artist, that could mean looking outward (visiting a museum, gallery, or even just some amazing blogs), or looking inward (meditating with intention). 3. Force yourself to see things in a new way: With a visual design, you could flip or mirror your canvas. You immediately see it differently, and often the mistakes become glaringly obvious. Shawn Feeney is a multifaceted designer and creative lead based in the San Francisco Bay Area. Formerly an artist at Lucasfilm, he’s designed for the White House and host of other major organizations. I got this advice from watching a great talk by Rich Hickey, the inventor of the Clojure programming language. This talk is called “Hammock Driven Development“, and is basically a tutorial on how to solve really hard problems. One of the fundamental components of solving hard problems is to try to solve more than one hard problem at the same time. Let’s say I am trying to design a component of some complicated system, and there are two different solutions available. Some pros and cons are obvious, but I haven’t reached the clarity that is necessary to make an informed, committed decision. This is a hard problem. At that point what I usually do is write down everything that I know about the problem and both of the possible solutions, and move on to some other problem, usually completely unrelated. For example, if the hard problem that I just reached is in the personal project I am working on, I will go back to client work for a few hours or days (until I reach a hard problem there). By working on something else, I let my mind wander and free-associate in the background. Eventually, all the implications of all the pros and cons of each of the solutions to the hard problem become clearer. When that happens, it is time to switch back and finish what I started. This process is very slow and cannot be forced by thinking harder, but it is very effective at producing good solutions. This is called “the synthesis”, if you like the ancient Greeks. Yuri Niyazov concentrates on special projects, including research and skunkworks projects whose business value is currently unknown (but may be high), as well as untangling legacy codebases. Loosen up: Try a measured dose of alcohol! 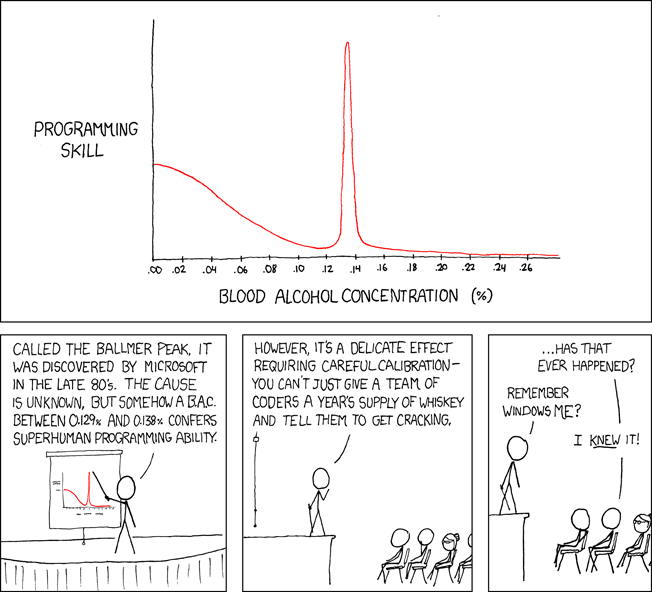 (for reference, see xkcd.) Sometimes I’m stuck because I’m thinking too hard about a problem, creating tunnel vision. Taking a more relaxed approach can broaden my perspective, often leading to a more elegant approach that I hadn’t previously noticed. Switch to a side project: I usually have one or two side projects that are very different to help me stay creative and engaged. When I’m feeling burned out, I work on one of those as a creative outlet. These side projects could be anything from drawing and painting to building a RaspberryPi robot, while the main job is iOS and full stack engineering and product development. Here are some tricks that I tend to use when hitting walls, be it for art direction, design, or front-end development. A. Take a break from the computer and go and do something completely un-work related for 30 minutes to an hour. During this time you’ll find that you subconsciously think of a solution to the problem or creative challenge. B. Inspire yourself. When hitting creative walls, spending time looking at the work of others can help manifest ideas to start your creative process. Even if you aren’t an art director, who says you can’t build a “mood board” just for your own personal inspiration? C. Research and learn. Sometimes we hit problems either in development or design we’ve never experienced before. Be it bugs, glitches, or performance issues. There is no shame in learning even if you are an expert at what you do. Take advantage of the wealth of information, discussions, and other developers that exist online. Erik Zuuring is a Designer & Front-end Developer based near Mont-Tremblant, Canada, in a mountainside chalet where he works with a wide range of international clients in the technology sphere. 1. Sleep: Lie down for a 45-minute nap. 2. Shower: Take a relaxing 20-minute shower. 3. Stimulate: Hop on a 1-hour bike ride and listen to Long Now Podcasts. 4. Rinse & Repeat: As needed. Todd Siegel is a product designer and thinker focused on UX prototyping for iOS and web. He’s also a wordsmith with wordperformances.com. For breaking the creative block, we’ve always suggested to our clients in music that they find ways to break the routine that got them stuck. The most common one that comes to mind is setting an alarm for the middle the night and then waking up and attempting to write at a time when your subconscious is fully running the show. We’ve heard that people had good results with that. Anything else that shakes them out of their routine to get the ball moving. Also, sometimes collaborating with others makes for a very good block breaker. Michael Solomon is 10x Management’s co-founder, with nearly 20 years experience managing technologists, as well as musicians and artists through his other agency, Brick Wall Management. If you feel burned out, tired, and are having trouble concentrating, you definitely need a break. But if you don’t have the time to take a few days off, the second best thing is to go work from a place that does not feel like work. There are many places around the world that are super cheap to get a house in, have reliable WiFi, and are on a beautiful beach or somewhere else that is awesome to be. I you live in New York City or San Francisco and Airbnb your place at the same time, you might even save or make money! Belize or Costa Rica (and potentially Panama): Very cheap, modern, have reliable and relatively fast WiFi. You can scuba dive or surf in the morning and work next to the beach the rest of the day. There are no distractions around, so you can actually focus on work. Las Vegas: During the middle of the week you can get a room at the MGM or Hard Rock for $35 to $45. Work next to the pool during the day and go see a show or play some poker at night. You can even get a room at the Grand Downtown for around $15 a night and hang out in the local startup scene. Shahar Nechmad is a programmer and advisor to major tech firms. He is also a frequent speaker at technology and advertising conferences around the world, addressing the value of data and the future of digital advertising. Give up. If you’re banging your head against a wall, trying and failing to get work done, give yourself the permission to play instead. Walk away, and work on things that don’t matter. One of my personal heroes, the physicist Richard Feynman, has a great story about this. At one point in his career, he was stuck. His failure to live up to his and others’ expectations of his work was utterly overwhelming. So he gave up. He figured that, since he was obviously an abject failure, he might as well go play instead. Feynman put his work aside, and let his curiosity guide him to a problem of absolutely no consequence: “I wonder what equation describes the wobbling of a spinning dinner plate?” As it turns out, giving himself the permission to play not only reignited his creativity… this problem of no consequence eventually led to the work that won him the Nobel Prize in Physics! Altay Guvench is 10x Management’s co-founder and technology specialist. He is a full-stack Ruby on Rails developer, two-time Y-Combinator alum, and a professional musician. I usually end up taking a break from a specific task and moving to something else in the project. Usually projects have some tasks that require minimal thinking but a lot of monotonous work, and then there are tasks that require creativity and ingenuity. I always prioritize working on creative tasks, so that when I am stuck in one of them, I can switch gears to the monotonous tasks and let my subconscious find a solution for the current block. Ahmad Alokush is a seasoned mobile software consultant based in New York City. He has worked with bulge bracket investment banks and Fortune 500 corporations, including Goldman Sachs, Morgan Stanley, Credit Suisse, Citi, Barclays, Novartis, and Hearst. I often find the difficulty I’m experiencing while solving a problem is due to how I’m conceiving of it in the first place. While in the middle of a tough project, I can get lost in the details and end up overcomplicating the issue and confusing myself, unable “to see the forest for the trees”. I’ve discovered that describing my situation to an outsider (my wife, for example, who’s doesn’t work in technology, but is an excellent listener) forces me to adopt a simpler, common-sense perspective to break the problem down into more intuitively understandable parts for them. The solution usually reveals itself midway through my explanation and I end up running away to finish the work. Mark Mian is a technology brand strategist and creative director with a background in cognitive neuropsychology and 15 years experience helping tech companies express their potential.